It wore out its “welcome” almost immediately. Ugh. There truly are not 250 words to say about this book. It came out in 2010, when these blog/website collections of things like passive aggressive notes or angry looking zoo animals or whatever were everywhere, and they kept getting book deals. I went through a period when I thought they were hilarious. I added a few to my Goodreads to-read list. I have a system for randomizing my next book, and when I come across one of these old “should’ve just been a website” books, I usually just remove them. (I’m not the only one whose TBR list goes back like 7 years…right?) Well, this one came up, and I decided to go ahead and check it out because someone in my family is dating a loooooser (seriously, he should probably sue TLC for royalties since No Scrubs was clearly written about him) whose use of quotation marks on social media is excruciating. So that’s how this book ended up in my house. The premise is occasionally funny, sure. 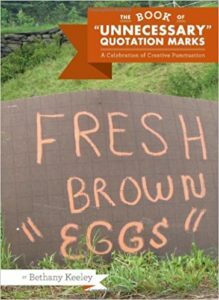 Fresh brown “eggs”? That sounds…questionable. A poorly placed set of quotation marks can lead to hilarity, definitely. Not an entire book’s worth. Just, nah. It includes a little blurb either explaining the joke or theoretically adding to it. The blurb is funny about one in ten times, which leaves some room for “improvement.” The pictures are also funny about one in ten times. There’s a whole page of store signs saying “‘Thank’ you for coming.” That really wasn’t even funny once, much less as a collage. People having weird, crappy grammar is not in and of itself funny. It’s funny when it inadvertently implies something else, like fresh brown “eggs.” That’s about it. Share the post "It wore out its “welcome” almost immediately."